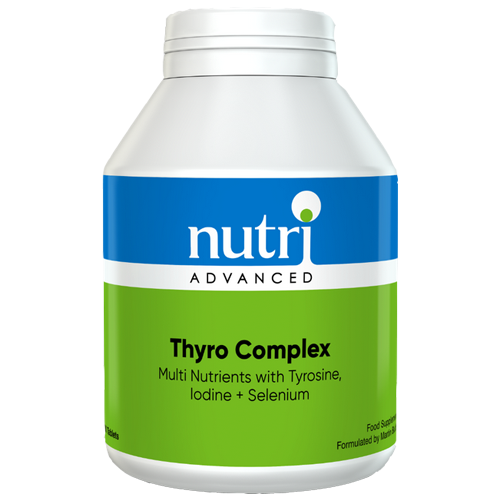 Nutri Advanced Thyro Complex is a synergistic blend of nutrients and herbs including selenium and iodine, both of which contribute to normal thyroid function. Thyro Complex also contains the amino acids tyrosine and phenylalanine as well as B vitamins and copper, which are essential co-factors in the metabolism of tyrosine. Thyro Complex's Kelp is a concentrated source of bio-available iodine which is well known to support the normal production of thyroid hormones and thyroid function. In addition, Thyro Complex also contains B vitamins such as niacin, riboflavin and vitamin B6, all of which support energy-yielding metabolism and the reduction of tiredness and fatigue. 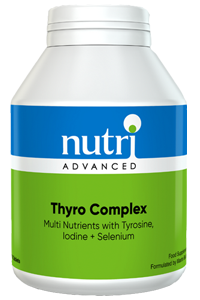 Nutri Advanced Thyro Complex has been formulated by well-known naturopath Martin Budd ND. 1-3 tablets daily before food, or as directed. Tableted with: Magnesium stearate, Microcrystalline cellulose, Silicon dioxide, Stearic acid, Dicalcium phosphate, Hydroxypropyl methylcellulose, Glycerine. This product contains vitamin A. Do not exceed 750µg of vitamin A (as retinol) per day if pregnant or likely to become pregnant except on the advice of a doctor or antenatal clinic. Do not take if suffering from phenylketonuria (PKU) (phenylalanine). Do not take if suffering from Wilson�s disease (copper). Consult with a medical doctor if taking thiazide diuretics (liquorice). If pregnant, breastfeeding, taking any other kind of medication or have a medical condition, consult a healthcare practitioner before using this product.